Why Your Next Sink Should Be Composite Granite! A composite granite sink is a special engineered stone that uses a granite composite material consisting of 80% granite or quartz (the strongest component in granite). The other 20% of the material is made from resin, commonly an acrylic resin, which makes the final product much less porous than pure granite and increases its hardiness and longevity. 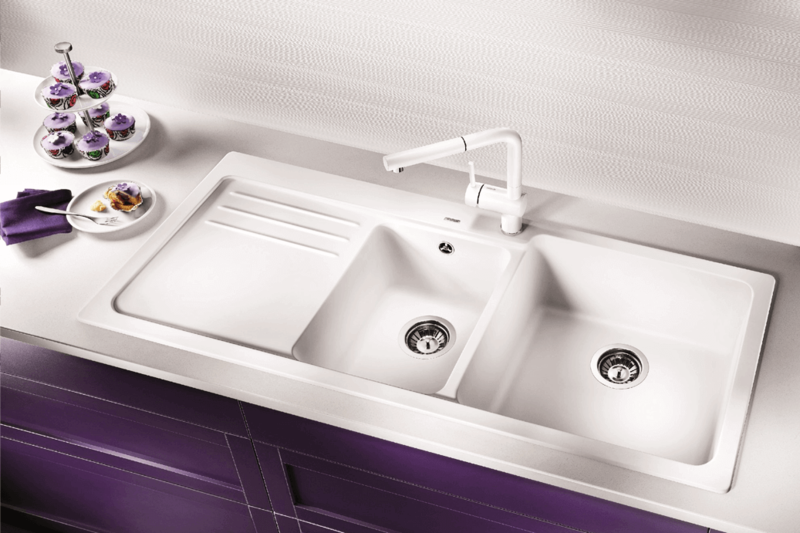 As well as their durability, this type of sink is highly practical and comes in many different designs, so they are guaranteed to fit any aesthetic, and can be used in both the kitchen and laundry. How Are Composite Granite Sinks Made? During the manufacturing process, fine granite is combined with resin. The mix is poured into a mould and then subject to hardening through a special heating and cooling process which ensures uniform thickness and durability. The solid material and prudent manufacturing process means that composite granite sinks are scratch-resistant and unbreakable. The colour is guaranteed not to fade over time, keeping your sink looking brand new for a lifetime. Your kitchen sink is writhing with bacteria, and you don’t even know it. They’re in your drain, on your tap, on your chopping board. In fact, studies prove that you’d be better off eating from your toilet seat than from your kitchen sink! However composite granite is the most hygienic material you’ll find – the manufacturing process allows a completely smooth surface and gives this sink its anti-bacterial properties, helping to keep those nasty germs to a minimum. Some manufacturers like Blanco even add an antibacterial coat to further reduce bacteria. One of the greatest advantages of composite granite over stainless steel is that they don’t leave water marks, making them very easy to clean. For easy cleaning, we recommend using a brush or sponge, and a light detergent. You can use a harder brush if necessary, but avoid using harsh chemicals. No matter which colour you choose, the grain is uniform throughout the sink so it will always look pristine. Due to their popularity, many different options for composite granite sinks are available. 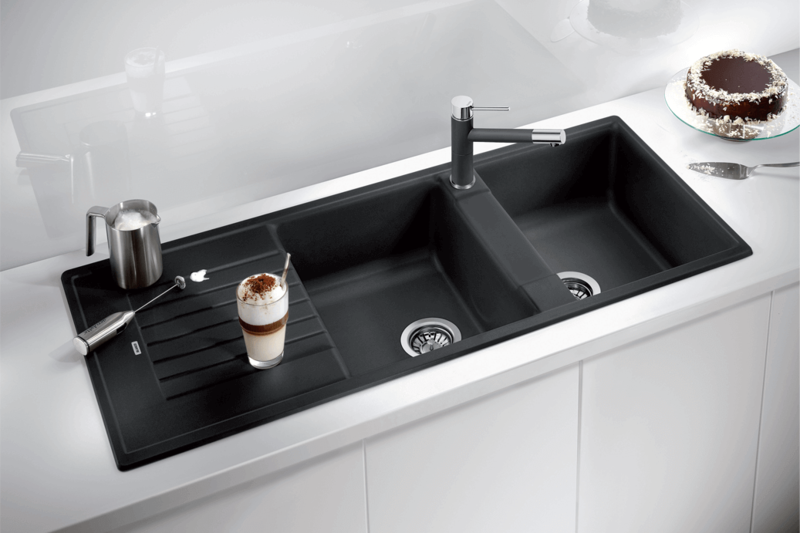 They can be made in almost any colour, but are most popular in black, white and grey and have just as much variety in the style of sink as traditional stainless steel sinks – ranging from single bowls, all the way through to large double bowl sinks with drainers, so there are options for the laundry as well as the kitchen. There are also options to top-mount, undermount, or flush-mount these sinks. Composite granite sinks are not always as budget-friendly as stainless steel sinks, so you’ll need to fork out a bit more for a sink like this. Whilst their durability means that these sinks will last a long time, its not so great for your delicate kitchenware if they are knocked into the sink or dropped from a height. Sometimes the white coloured granite can show stains, so white may not be the most practical colour to choose, however these stains can be cleaned with Gumption and a Scotch-Brite sponge. Despite their cost, composite granite sinks are the way of the future, not only in design but also in practically due to their many favourable features. If you want a long-lasting, beautiful-looking sink for many years to come, then your next sink should definitely be a composite granite sink!